This year’s Banned Books List included a few surprises. The American Library Association's annual report highlights those books saddled with censorious complaints from parents, educators and assorted bureaucrats. Mom and Dad understandably would be horrified to find Fifty Shades of Grey in the elementary school stacks, but some administrators objected to Dav Pilkey's popular Captain Underpants kid-lit series. It appears some paper-shufflers found the silly superhero too disrespectful of their efforts. "I don't see these books as encouraging disrespect for authority. Perhaps they demonstrate the value of questioning authority," Pilkey said. "Some of the authority figures in the Captain Underpants books are villains. They are bullies and they do vicious things." We learned over the weekend that school office bullies aren’t restricted to the K-12 world. Two California university professors seem to be creating their own list of books to ban, including any titles that dare question their disintegrating theory of apocalyptic climate change. San Jose State University posted a photo of their Climate Science profs about to burn Steve Goreham’s book, The Mad, Mad, Mad World of Climatism. 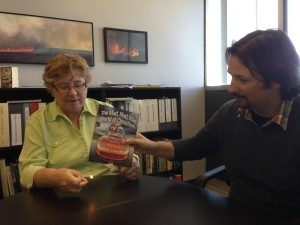 Department chair Alison Bridger, Ph.D., is shown holding a match while associate professor Craig Clements , Ph.D., dangles the book above the flame. Once the photo started going viral, university officials removed it from their website and insisted it was just a joke. Hilarious, no? Joke or not, while academia constantly warns of metaphorical right-wing book burners, academic arson is literally happening on the left. The enviro-left in academia has “progressed” from ignoring all this non-alarmist evidence, to trying to dismiss it, to failing at that, to refusing to debate, to fudging data and blackballing contrarian evidence, to committing crimes against The Heartland Institute, to now showing the world that putting a match to evidence from the “other side” is a reasonable reaction. Pathetic. We are witnessing the death throes of a cult in real time, and it ain’t pretty. The American Library Association doesn’t list The Mad, Mad, Mad World of Climatism on this year’s Banned Books List, but maybe San Jose State will catch their attention. If I may paraphrase the creator of Captain Underpants, I don't see Goreham's book as encouraging disrespect for authority. Perhaps it demonstrates the value of questioning authority. Some of the authority figures in The Mad, Mad, Mad World of Climatism are villains. They are bullies and they do vicious things. The book should not be burned. Rather, it should be countered by scientists. On Earth Day, President Obama traveled to the everglades in Florida to promote his climate change agenda.